In a busy classroom there are many distractions that pull teachers away from their capacity to see the small details in what a child might be doing that would give clues about the important purposes or questions that are likely under consideration. If we want to see, value, and extend children’s ideas we teachers need to be fully present in the child’s moment, develop our capacities to observe, and assure that children know through our body language and interactions that we have fully joined them. Children know when we are truly listening and when we are distracted, and need our full attention in respectful interactions with teachers to learn deeply. This is true as we set a safe emotional social climate for children, and it is equally true when we try to understand what children know or are curious about in specific content areas. A recent example of this came when a young 3-year old approached a game set up to put pom-poms in cups labeled 1-12 using tongs. We teachers imagined the task as a straightforward one, primarily supporting counting and number sense as children organized the cups in number order, read or asked about number symbols, and arranged pom-poms. We introduced our ideas about the basic task and joined children as they manipulated the tools and materials available to them. This 3-year old clearly wanted me to stay and play and I was lucky enough to feel able to join her without needing to check in often on other classroom activities. She understood the basic task as we presented it, found the 1 and the 2 cup, and chose her pom-poms, clearly more interested in the tongs, the texture and the color of the pom-poms than in counting. She proceeded to take handfuls of pom-poms, filling and emptying cups, talking with me about their colors, and making piles. I left a few times as she played, promising to come back as soon as I could, and whenever I was there we chatted about her piles, colors, and her process. I occasionally asked an open-ended question like “I wonder where those need to go” but I mostly watched and described what I saw her doing. Looking at her first approach to this material, I might have easily made assumptions about her level of understanding of numbers, and underestimated her skills and understanding. I might have tried to teach by pointing out how many pom-poms belonged in each cup. I might have missed her interest in the number 3 as she manipulated the tongs. And I might have undervalued her strong interested in sorting by color. I might easily have missed her accurate use of the word “sets” as she added 3 pom-poms to 3 already in her cup labeled 6. If I did, I would have had less insight into conversations and experiences she is probably having with family, as I am fairly certain we haven’t introduced the word or concept of sets here at school. 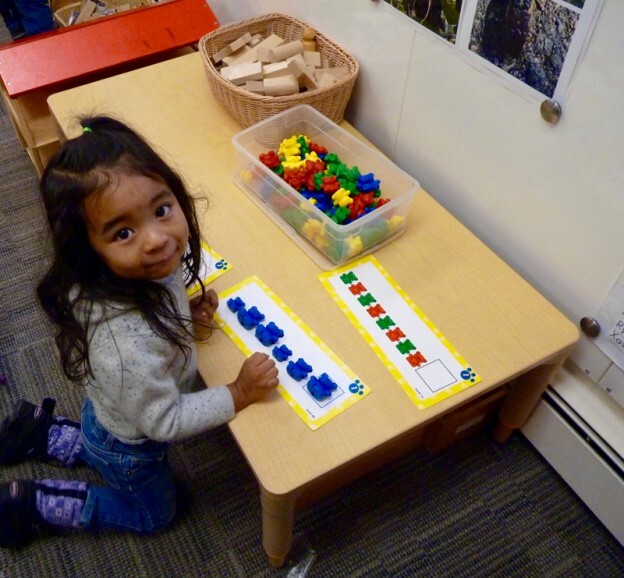 Another example also came when a child was using math cards – building and/or extending patterns with bears in 3 sizes and colors. She called me over, proud to share that she had successfully matched the bears. She hadn’t tried to extend that pattern, so I simply asked “but what would come next?” That started an extended game with me, where she would choose a bear that matched one but not both attributes that would accurately complete the card as designed. We were both laughing and repeating “but what would come next?” Rather than correct or teach, I left it there and we moved on with our day’s activities. It was 2 days later that she called me over again, proudly sharing the same card, this time with the pattern extended. Children learn in relationships, and deserve our full, uninterrupted attention whenever we can give it. This entry was posted in Curriculum, Education and tagged curriculum, development, education, learning, preschool on January 7, 2018 by Katrina Selawsky.